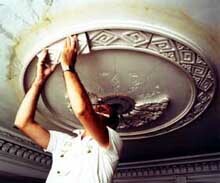 Running and enriching a ceiling medallion. Photo: Peter Sanders. From the time America struggled for a new identity as a constitutional republic—and well into the 20th century—its architecture and its decorative detailing remained firmly rooted in the European classicism of Palladio, Wren, and Mansart. Together with skilled masons and carpenters, ornamental plasterers saw their inherited trade flourish from the mid-18th century until the Depression years of the 1930s. During this two hundred year period, as the Georgian and Federal styles yielded to the revivals—Greek, Rococo, Gothic, Renaissance, and Spanish—decorative plaster reflected each style, resulting in the wide variety of ornamentation that survives. The traditional methods of producing and installing interior decorative plaster were brought from Europe to this country intact and its practice remains virtually unchanged to this day. This Preservation Brief has been prepared to assist property owners, architects, contractors, and Federal agency managers in identifying the causes of ornamental plaster failure, specifying repair and replacement techniques and engaging qualified professionals to do the work. 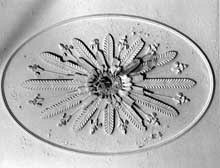 The scope of this Brief is limited to the repair and restoration of existing ornamental plaster; certain forms of decorative plaster such as scagliola, composition ornament, and artificial Caen Stone are not addressed, nor is the design and installation of ornamental plasterwork in new construction. 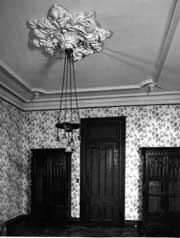 Finally, guidance on using substitute materials to match the historic appearance of ornamental plasterwork—a legitimate option within the Secretary of Interior's Standards for the Treatment of Historic Properties—is not discussed here, but will be the subject of another Brief on interiors. As builders and architects were hired by an increasingly affluent clientele, ornamental plaster shops developed from the single artisan operations of the 18th century into the complex establishments of the early 20th century. 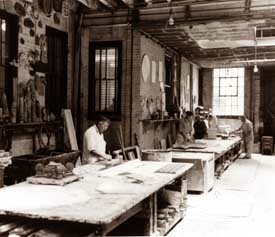 American plaster studios employed immigrant and, later, native craftsmen. Plasterers' guilds were in existence in Philadelphia in the 1790s. In 1864, a plasterers' union was organized in the United States with members from the British Isles whose work there had been limited to palaces and churches. English and European craftsmen came to America where the demand for their skills had increased by the decade, offering them the unparalleled opportunity to open their own shops. 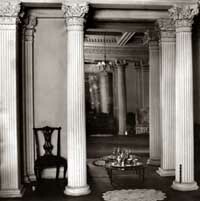 Over the years, plaster elements became so popular in decorating interior spaces that a major industry was established. By the 1880s, catalogs were available from which property owners could select ornamentation for their splendid new buildings. Historically, ornamental plasterwork has been produced in two ways: it would be run in place (or on a bench) at the site; or cast in molds in a workshop. 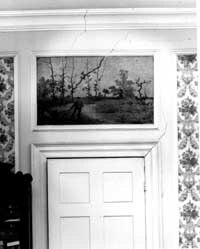 Plain plaster molding without surface ornamentation was usually created directly on the wall, or run on a flat surface such as a plasterer's workbench and attached to the wall after it set. 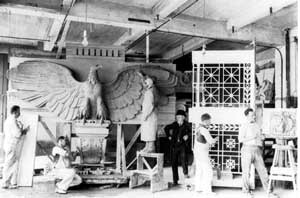 Ornament such as coffering for ceilings, centers for light fixtures (medallions), brackets, dentils, or columns were cast in hide glue (gelatin) or plaster molds in an offsite shop, often in more than one piece, then assembled and installed in the building. Three decorative plaster forms in particular—the cornice, the ceiling medallion, and the coffered ceiling—historically comprised much of the ornamental plasterers' business. These forms appear individually or in combination from the 18th to 20th century, irrespective of stylistic changes. For flat plaster walls and ceilings, as well as decorative forms, the system to attach interior plaster to walls and ceilings primarily consisted of 1/4" x 1-1/4" wooden lathing strips nailed 3/8" apart against studs and joists. First a scratch coat consisting of sand, lime, and cattle hair was troweled on the lath and pressed through the slots so as to slump over and form "keys." Next, a brown coat was applied to establish flat and plumb surfaces. The earliest plasterwork consisted of two coats of lime and sand plaster; later in the 19th century, a third or finish coat was applied that consisted of both lime and gypsum. Decorative units were generally attached to the substrate using plaster as an adhesive. Failure of the substrate is more typical than failure of the plaster ornament itself. Among the reasons for deterioration, structural movement and water intrusion are the most deleterious. Buildings move and settle, causing deflection and delamination which result in stress cracking. These cracks often begin at the corners of windows and doors and extend upward at acute angles. Roof or plumbing leaks make finishes discolor and peel and cause efflorescence, especially on plain-run or enriched cornices. Unheated buildings with water intrusion are subject to freeze-thaw cycles which ultimately result in base coat and ornamental plaster failure. Plaster failure is a matter of degree. For example, top coat failure can be repaired by applying a new finish coat over a sound early substrate. Also, if cracking or loss of all three coats has occurred and is not combined with major structural failure, it can be repaired much like flat wall plaster. For ornamental plaster, however, repair beyond patching is often equivalent to targeted replacement of entire lengths or portions of run-in-place and cast ornamentation. 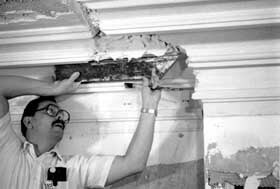 Pieces that are deteriorated or damaged beyond plain patching must be removed and replaced with new pieces that exactly match the existing historic plaster. For this reason, partial restoration is often a more accurate term than repair. But whichever term is used, it is not recommended that repair of ornamental plaster be undertaken at any level by property owners; it is a craft requiring years of training and experience. A qualified professional should always be called in to make an inventory of ornamental plaster enrichments and to identify those details which are repairable onsite and which should be removed for repair or remanufacture in the shop. Generally, a highly functional shop should look well organized—that is, not in disarray with remnants of past projects lying about to impede current production. Old molds may be in abundance, but hanging from the wall or otherwise "on file." Machinery (saws and drill presses) and hand tools should appear well maintained. In short, one might evaluate such a studio as one does an auto mechanic's shop: does it inspire confidence? This is the time to look around and ask questions. What is the shop's past project work experience? Is the firm mostly involved in new construction work or total reconstruction? More important than the way the shop looks, is the personnel sufficiently experienced in making repairs to historic decorative plaster? What about training and apprenticeships? How did the staff learn the trade? The more that is known about the total operation the better. Familiarity with contemporary molding rubbers is desirable. There are several formulations currently on the market. In the past, flexible molds were made with hide glue melted in a double boiler and poured over plaster originals which had been prepared with an appropriate parting agent. Of the newer rubbers, latex (painted on the model coat by coat) is time consuming and has little dimensional accuracy; polysulfide distorts under pressure; and silicone is needlessly expensive. Urethane rubber, with a 30-durometer hardness, is the current choice. Urethanes are manufactured as pourable liquids and as thixotropic pastes so that they can be used on vertical or overhead surfaces. The paste is especially useful for onsite impressions of existing ornament; the liquid is best used in the shop much as hide glue or gelatin was historically. Urethane rubber has the ability to reproduce detail as fine as a fingerprint and does not degrade during most ornamental plaster projects. No flexible molding material lasts forever, so spare casts should be maintained for future remolding. Molding plaster will also be in evidence; it is the product most similar to that used historically. This plaster is finely ground to accept the detail of the rubber molds, not so hard as to prohibit tooling, and combines readily with finish lime. High-strength plaster is available in varying densities, some with added components for specific purposes. Most shops maintain these varieties, but use molding plaster for typical work. The contractor's familiarity with sheet metal is critical. Accurate template blades are required to reproduce both straight and curved sections of moldings. The blades must be carefully cut, filed, and sanded in order to form exact reproductive units. A tour of a sizeable shop will include observation of running techniques and the results of this activity should be much in evidence. Regardless of size, these runs should be smooth and true when made by qualified craftsmen. Models, whether of capitals, cornices, medallions or cartouches, are made as whole units or in parts depending on project demands. Completeness, accurate dimensions, and attention to historic styles are essential ingredients of successful models. Each part of a model has a name, i.e., dentil, guilloche, rinceau or bolection molding, modillion, egg and dart, and the designers and restorers of these ornaments should know their names. Failure to identify these parts correctly should be of concern to a prospective client. Molds are "negative forms" produced from completed models. Simple flood molds require a separator or barrier coat over the original and a surrounding fence to prevent the liquid rubber from leaking out. Larger or more complicated molds are made in pieces or with a layer of rubber supported by a plaster shell or mother mold attached to a wooden or metal frame. Following completion of a successful mold, the original model is discarded because it is now possible for it to be accurately reproduced. Casting operations should appear clean and efficient. A skillful caster's output can be voluminous and often looks effortless as it is being produced. Raw materials are close at hand, molds are rarely without curing plaster in them, production is stored so as not to warp while it is still wet and each cycle, from mixing to pouring, setting, and demolding is accomplished so as not to waste time or break plaster casts. A good caster generally obviates the need for a finishing department. 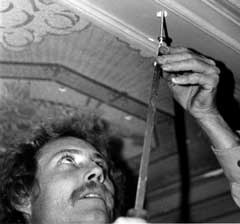 A section through the cornice may be determined by sawing through the molding, inserting a sheet metal blank in the slot and tracing the profile directly on the template. This is considerably more accurate than the profile gauge, but will require repointing the saw kerf; alternatively, the cut may be made on one of the deteriorated pieces, provided it was removed as an intact unit. The section may be obtained by making a thixotropic rubber impression of the molding, casting the result in fresh plaster and sawing through the cast to transfer the cross-section to a sheet metal template. Ceiling medallions are often in greater jeopardy than cornices because the joist-lath-base-coat support system is susceptible to deflection and the force of gravity. 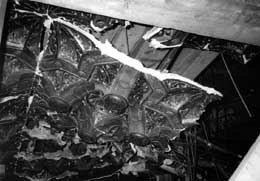 The problems of ceiling failure are more frequent in the centers of parlors because circular-run and shop-cast ornament is often quite heavy and was not historically attached with any additional mechanical fasteners such as bolts and screws. 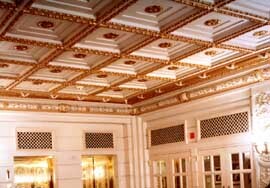 Like cornices and medallions, coffered ceilings suffer from poor maintenance practices and structural problems; however, these individually cast ceiling units are particularly vulnerable when a building is being rehabilitated and great care is not taken in executing the work. 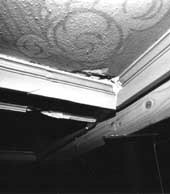 In the most serious of cases, portions of a roof can collapse, dropping heavy debris through the hanging coffering panels, and demolishing large portions of the ornamentation. Thanks go to the technical experts in the field who reviewed and commented upon the draft manuscript: M. Earle Felber, Andrew Ladygo (Jefferson Poplar Forest), Lee H. Nelson, FAIA, Gilbert Wolf (National Plastering Industries), and Stephen Zychal (Ornamental Plastering, Inc.). Insightful comments were offered by Gary L. Hume, Acting Chief, Preservation Assistance Division, Karen Kummer, Small Homes Council-Building Research Council, University of Illinois, NPS cultural resources program regional offices, and the staff of Technical Preservation Services Branch, H. Ward Jandl, Chief. Old-House Journal and Fine Homebuilding were most generous to grant permission to use photographs from their publications. Kay D. Weeks is credited with coordinating this technical publication and with general editorship. Bankart, George. The Art of the Plasterer. London: B. T. Batsford, 1908. Dalton, Byron William. Practical Plastering and Cement Finishing and Related Subjects. Chicago, Illinois: Byron William Dalton, 1949. Flaharty, David. "Ornamental Plaster Restoration." Fine Homebuilding. No. 57, December, 1989/January 1990, pp. 3842. Garrison, John Mark. "Decorative Plaster: Running Cornices." The Old-House Journal. Vol. XII., No. 101, December, 1984, pp. 214219. ____________. "Casting Decorative Plaster." The Old-House Journal. Vol. XIII, No. 9, November, 1985, pp. 186189. Gypsum Construction Handbook. Chicago, Illinois: United States Gypsum Co., 1986. Harris, Cyril M., editor. Illustrated Dictionary of Historic Architecture. New York: Dover Publications, 1983. Millar, William. Plastering, Plain and Decorative. London: B. T. Batsford, 1897. Phillips, Morgan. "Adhesives for the Reattachment of Loose Plaster" Association for Preservation Technology Bulletin, Vol. XII, No. 2,1980, pp. 3763. Van den Branden, F. and Hartsell, Thomas L. Plastering Skills. Homewood, Illinois: American Technical Publishers, Inc., 1984.